This is a burnt edge textured frame - in png format. Click on the image to download! As you all know I've started naming my kits with the word "Licious" in them, and would like to continue the same way. Right now I've started making a kit, but cannot think of a good name for it. All you have to do is come up with a nice name that includes Licious, or Delicious (or just sounds yummy!) and you can suggest the colours if you want to, and if I pick the name, you will get the kit for free (it will be a Pay To Use kit). Leave a comment as your entry! The contest ends on Oct 1st, and the following names are taken: DivaLicious, Rock-A-Licious, ScaryLicious and SugaLicious! Thank you so much for the frames, and the adorable charms. 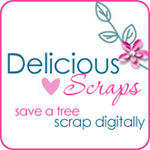 How about ScrapLicious, or KitLicious? Colors:Tangerine, Lime, Cream, Coral and Chocolate Brown. My suggestion is Feastlicious using colors for fall/thanksgiving. Also Frostilicious with winter colors. This is great Thank You !!! Thanks for sharing. I suppose the contest is over, right? Thank you so much for sharing your work! !